Happy Labour Day! And what better way to spend a holiday relaxing from your labours, than by reading a great book? Overdrive lets you do that - free! So what exactly is OverDrive? OverDrive is an online repository of audiobooks, e-books, videos, and music accessible to library and school patrons worldwide. The content available differs between each institution, and most borrowed materials are available to be enjoyed for a limited time through the OverDrive website or app. What is the OverDrive app, then? The OverDrive app is a program available for desktop computers, tablet computers, and smart phones. It allows access to the content of library materials that are borrowed from OverDrive and then downloaded onto your device, instead of being accessed directly on the OverDrive website. How much does OverDrive cost? Zero. Zilch. Nada. That's right, OverDrive is completely free to use. You won't even be charged late fees, ever. That's because OverDrive automatically deletes any items that you've borrowed from your account once their lending periods are up. Or, if you've downloaded certain items (using programs like the OverDrive App or Adobe Digital Editions), they'll automatically deactivate on the services that you used to access them. This means that you won't ever have to remember to do it yourself, and so you'll never get fined. The only exceptions are certain periodicals, such as newspapers or magazines (if your library has them). If you download them on certain devices, they will stay there until you manually delete them. However, periodicals aren't subject to late fees anyway, so you can rest easy. One last note: if you transfer an item that you borrow to a different format, like putting an e-book on your e-reader or burning music or an audio book onto a CD, please destroy or otherwise erase the copy once the lending period is up. We wouldn't want you getting in trouble with the law, because that might actually cost you something. 1. Choose how you want to access OverDrive. You can access OverDrive from the website at www.overdrive.com, if you're on your desktop computer. However, if you have a tablet computer (such as an iPad) or a smart phone, you can download the free OverDrive app and access OverDrive from there. 2. Sign up for an OverDrive account. 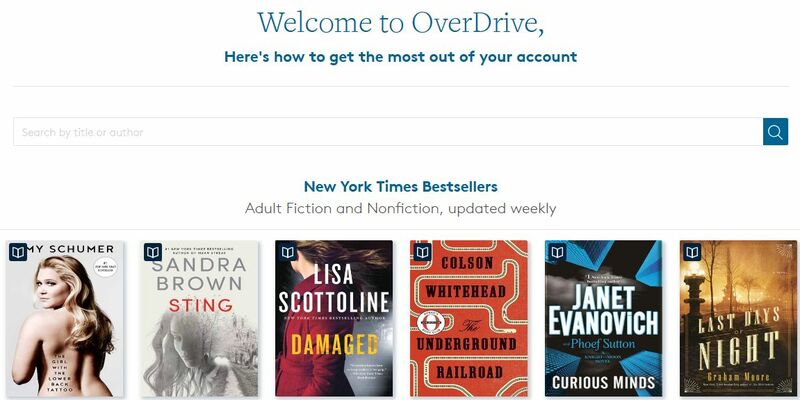 An account on OverDrive is free, and you only need to enter your name, email address, and a password in order to create one. You don't need an account to actually use OverDrive, but it's useful for keeping track of libraries that you access most often, or items that you search for and borrow repeatedly. 3. Find the OverDrive collection of your local library or school. Once you're on OverDrive, you'll need to find your local library or school in the system and see if they (or the network that they're a part of) have a digital collection available. If you find one, just enter your library card or student ID information, and you're in! 4. Browse and search for the media that you want. 5. Enjoy what you find! Once you've found an item, you can go ahead and borrow it with a single click! Or, if you're not sure that you'll like it, you can listen to or view a preview of it. You can also put an item on your "Wish List", see more details about an item, or share an item's details with your friends on your social media accounts. Once you borrow an item, you can play it right on OverDrive with their built-in media players, or download it in a particular format. From there, all that's left to do is view, listen, and enjoy! On the OverDrive course on TechBoomers, they'll show you how to borrow items from the OverDrive website, and enjoy them either on the OverDrive website or on the downloadable OverDrive app for your desktop computer or mobile device of choice! Get the education and entertainment of your local library right in the comfort of your own home with OverDrive!